I was born in Bucovina, Romania and today we celebrate 100 years since the union with all its historical provinces. Home is where your heart is and my heart is in Bucovina. More about Bucovina you can find here. Here are some Romanian recipes with the original name. Click on the link for the recipe. Enjoy! The Pepper Mill is a newly opened gem at Bandra. It’s has a lovely colourful decor and loads of seating available. They’re known for playing really good music. We interacted with a Chef Parag who recommended us a variety of dishes prepared by him. We left the choices on him and boy were we left surprised. The staff here is really helpful too. The pepper mill prepares in house a variety of breads like Lavash, Focassia, Cross Buns and Breadstick. They served it with 8 different kind of dips including hummus, guacamole, peri peri mayo and a lot more. We truly enjoyed gorging on this platter. It’s a good choice for a date as it pairs so well with drinks and is fun to eat too. Topping the list is Whiskey Tavern. Located at 79 Baxter St. (between Walker and White Streets) in Chinatown, it’s the highest-rated whiskey bar in New York City, boasting 4.5 stars out of 725 reviews on Yelp. 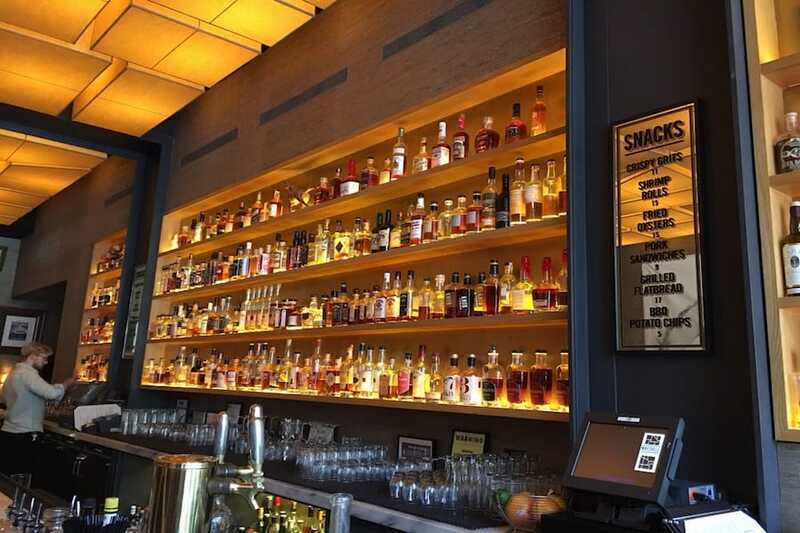 Whiskey Tavern’s expansive menus offers glasses and flights of bourbon, rye and scotch, classic and specialty cocktails, beer, cider, wine and more, on top of bar snacks and full meals. 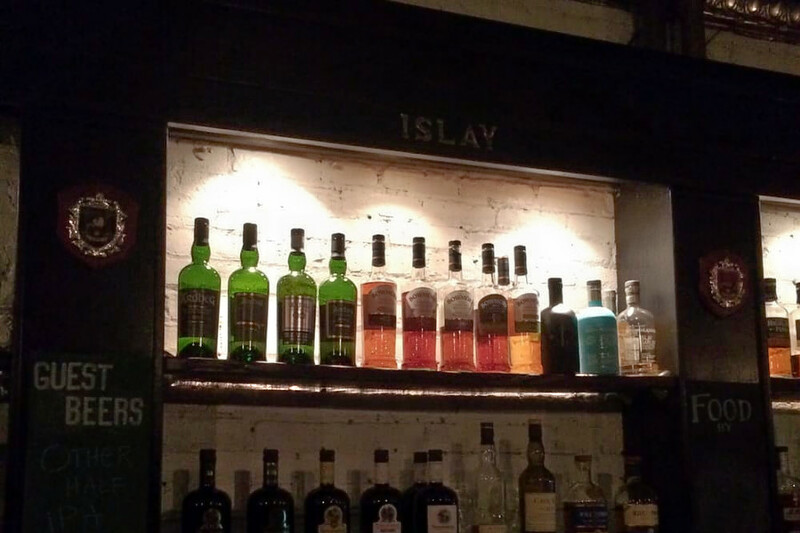 The tavern also has sister whiskey bars on the Lower East Side and Brooklyn, as well as a curated liquor store in Brooklyn that sells more than 100 different whiskies. Next up is Flatbush’s Wheated, situated at 905 Church Ave. (between Coney Island Avenue and 10th Street). With 4.5 stars out of 294 reviews on Yelp, the whiskey and cocktail bar, which offers pizza and more, has proven to be a local favorite. While there, look for Whiskey Wednesday specials that highlight a different variety each week. 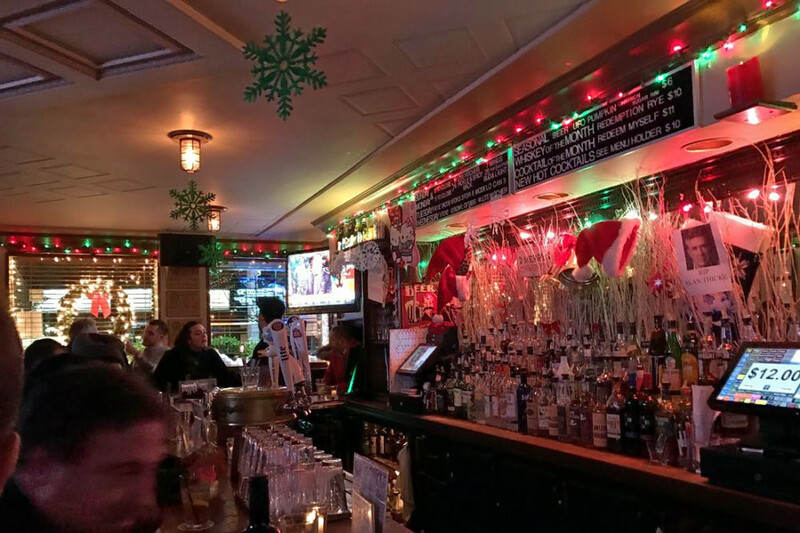 Yorkville’s Caledonia Bar, located at 1609 Second Ave. (between 83rd and 84th Streets), is another top choice, with Yelpers giving the whiskey bar and Scottish pub 4.5 stars out of 227 reviews. 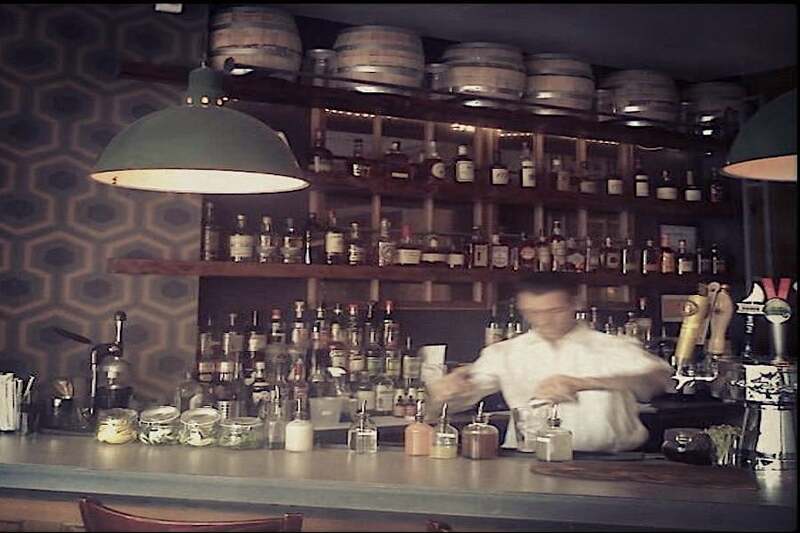 The small joint bills itself as “the world’s least pretentious whiskey bar.” On the menu, expect glasses and flights of the bar’s extensive selection, as well as cocktails, beer, wine and small plates. Sanfords Astoria, a whiskey bar and New American spot in Astoria, is another go-to, with four stars out of 661 Yelp reviews. Head over to 30-13 Broadway for tasting session over an upscale brunch, lunch or dinner. Over in Flatiron, check out Maysville, which has earned four stars out of 523 reviews on Yelp. 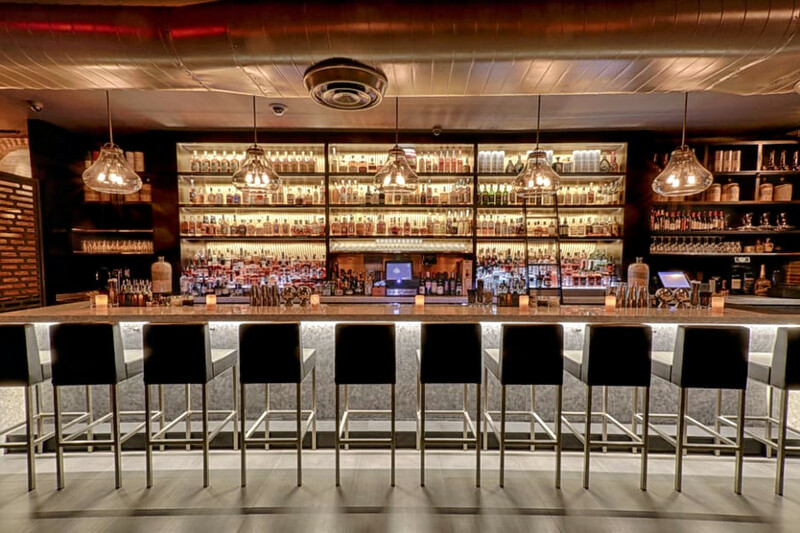 You can find the American whiskey bar and restaurant at 17 W. 26th St. (between Broadway and 6th Avenue). According to the website, the restaurant is named after the Kentucky port town from which whiskey was first shipped out of the state. Maysville regularly hosts whiskey tastings, classes and other events, and features The Early Bourbon deal, offering half-priced whiskies, as well as cocktails, beer and wine by the glass from noon-6 p.m. daily. It’s that time of the year again!!! The 14th Belfast Continental Christmas Market……and I’m really excited!!!! it’s in its usual home, Belfast City Hall. Had a wonder around today and the buzz was amazing. Lots of stalls, food from all around Europe and beyond, stuff for kids to do, Santa’s Grotto and gift stalls as well as confectioners and pastries and drinks!!!! Had my Kangaroo burger going to give the Yorkshire pudding a go!!! What will you have? Make your way down to the Twilight Market in St Georges Market, Belfast!!! Halloween has just finished and it’s straight into Christmas!!!! I attended the Belfast Musgrave Marketplace Christmas Party on the 1st November where Christmas has just begun!! The warehouse has all one needs when it comes to food, groceries, confection, drinks and snacks and lots more. There is a very good and well stocked Christmas shop and my two girls were already decorating the house!!! We were well plied with canapés of the savoury and sweet kind and we especially liked the salted caramel hot chocolates (Santa please make a note!!). I saw a couple of innovations worth mentioning. The first was a wide range of biodegradable cutlery, containers and straws which were pretty impressive. Also there was a wonderful spiced gammon which can boiled and/or ovened and which looked and tasted great. I think I will make a trip back to do my Christmas shopping….without any distractions! !